Magical Japanese Electric Circuit Marker Lights Up A Beautiful Paper Town. There are many inventions that make us stunned. This “Circuit Marker” is one of them that allows users to draw an electric circuit that can withstand up to 100 volts. The circuits are capable of lighting lamps and powering motors. Inventors AgIC demonstrated the pen by drawing a series of buildings on electronic-embedded paper that lit up to make a small 3D town, complete with street lights and a moving car. 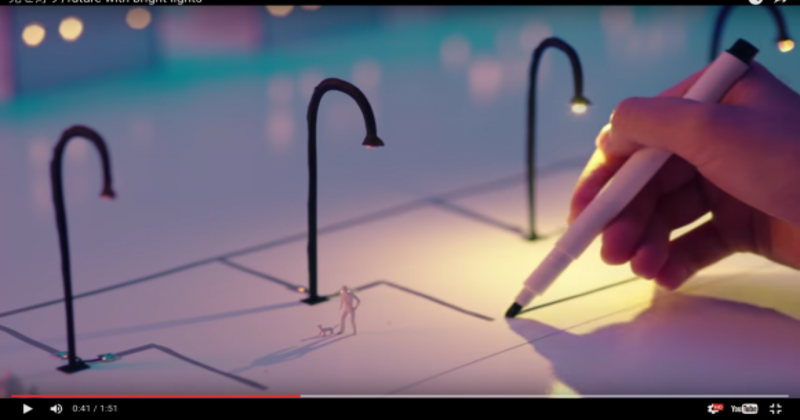 This strangely therapeutic video shows us the magic of the “AgIC pen” that draws electrical circuits to light up paper cities. Japanese infrastructure company Kandenko, which is involved in many fields including electrical and telecommunication. This magical invention has been released in a new video that featuring an AgIC pen, which allows you to draw ink that instantly conducts electricity over paper. You may think this is graphic but this charming artistic appeal of the pen is illustrated in all its glory in this short promotional video called, “Future with bright lights”. The pen takes us on a journey through little streets and towns lighting up the path as it goes along. The soothing flow of the video and relaxing music may gently inspire you to create your own electricity art.